Home › Shop › For the Bar › Stainless Steel Growler, 64 oz. Stainless Steel Growler, 64 oz. Whether you're toting around some of your homebrew, or beer from a local craft brewery, this stainless steel growler will be sure to do it in style while not breaking like typical glass growlers. 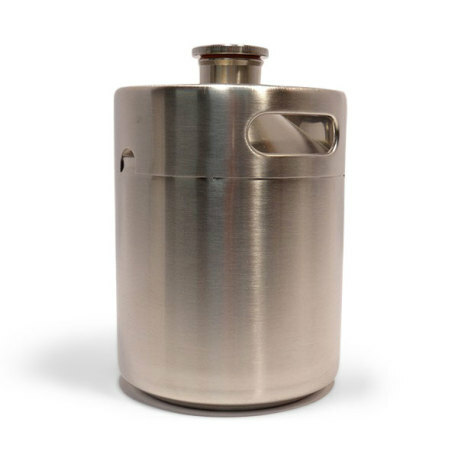 The mini-keg design comes with two easy carrying handles, and the stainless steel construction also allows you to bottle condition in (no more glass growler bombs)! Say goodbye to those glass growlers whose little finger holes are always just too small, and usually end up slipping out of your grasp and breaking on the floor! 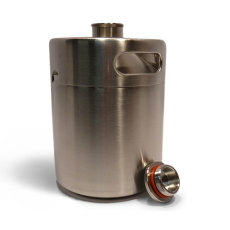 This mini-keg growler is constructed of 100% 304 stainless steel, and is sure to keep your in-transit beer safe from harm! When it comes to a growler, stainless steel is just flat out better for two reasons: you don't have to worry about breakage, and it also keeps out sunlight. 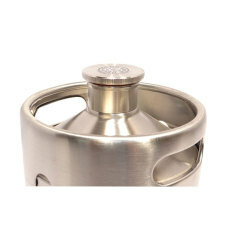 These stainless beauties also are great at holding pressure so your beer will stay carbonated longer, AND you can bottle condition your homebrew in them!